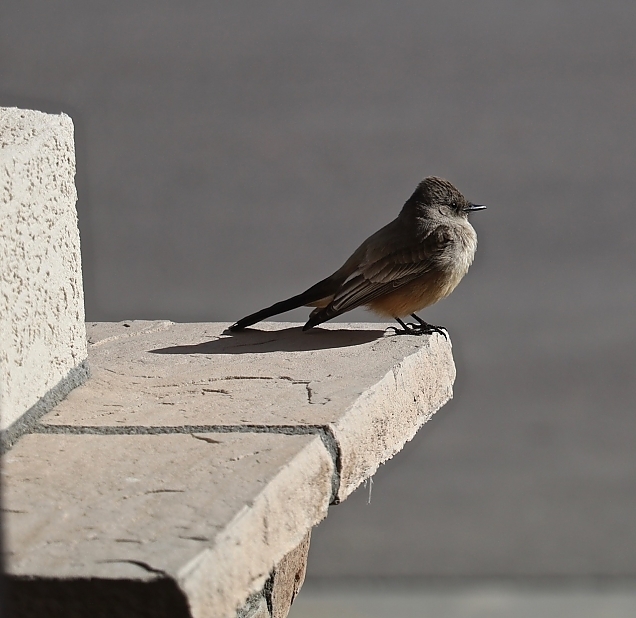 Last week I noticed a cute little bird hanging around our front yard. Especially in the morning hours when it would sit perched on one of the stakes that helps to keep our little pear tree upright. And no, it was not a partridge! Sorry, bad joke. I identified it as a phoebe after watching its behavior. You see, phoebes are in the flycatcher family and they like to catch bugs. They are sweet birds and good to have around. 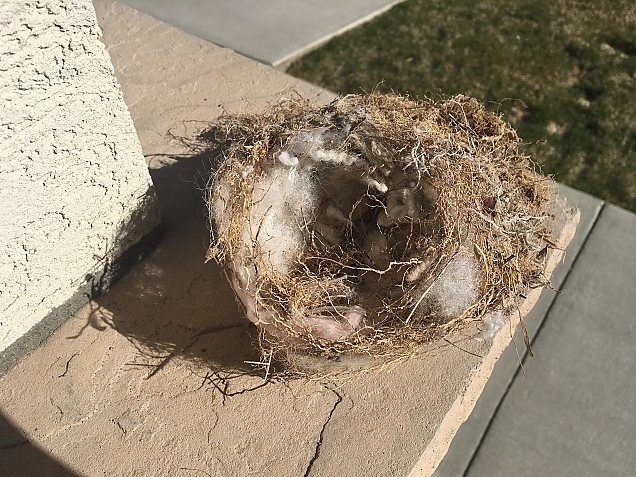 Yesterday morning I looked out the window to see a blob of stuff on our front porch which I thought might be a nest. It was. Apparently it had blown down from it's precarious perch on one of the columns on the front porch. No shattered eggs, so thankfully this nest was either abandoned or just didn't have babies yet. Notice the interesting materials used in building it. Pieces of broken tumbleweeds (we have lots of those), various assorted grasses, and big pieces of insulation snatched from one of the houses that are being built all around us. Our section of the street is an on-going construction zone. Do you think the insulation keeps the nest warmer or just scratchier? Not to worry, the phoebes have an almost identical nest on the other column that they are using as their home base. This one is well protected from the winds and well enough anchored that I don't think it's going to go anywhere. 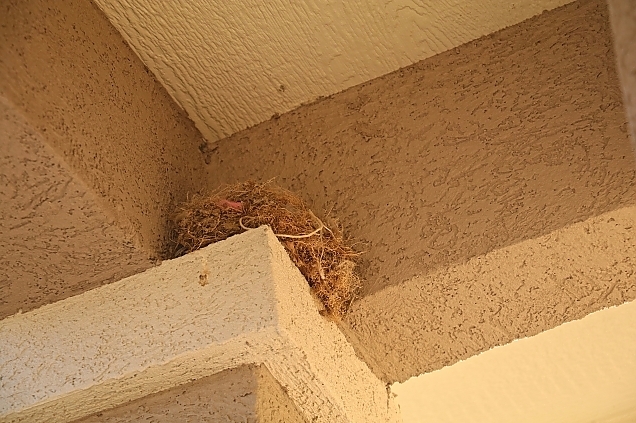 Note: As I opened the front door this morning to take a photo of the existing nest (below) one of the phoebe's flew out of the nest, hence my title! When we were looking at this house, one of the first comments I made as we walked up to the front door was that there were great places for birds to make nexts at the entrance. Got that one right.